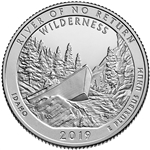 The Frank Church River of No Return National Park Quarter design depicts a piloted drift boat on the rushing river encompassed by the trees and rock formations of the Wilderness. Inscriptions are "RIVER OF NO RETURN," "WILDERNESS," "IDAHO," "2019," and "E PLURIBUS UNUM." This is the final quarter for 2019, and the 50th overall in the America the Beautiful Park Quarter Program.